Veteran journalist and author Joseph C. Goulden offers a good review in the Washington Times of William J. Rust's Eisenhower & Cambodia. Did the Eisenhower administration, acting through the CIA, join Thailand and South Vietnam in an attempt to overthrow Norodom Sihanouk, the mercurial king of Cambodia, as the Indochina War approached a boiling point in 1958 and 1959? Such is the question posed — but not definitively answered — by William J. 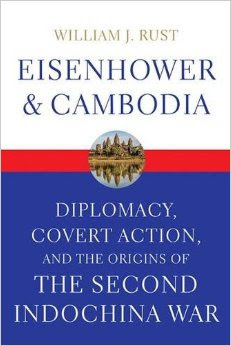 Rust in the fourth volume of his series of books on the diplomatic history of the Vietnam War. Mr. Rust offers overwhelming evidence that CIA officers know of the plot and, indeed, supplied logistical support. But did their efforts go beyond a careful watch on the scheme, to the point that CIA was collaborating in a plot aimed at Sihanouk’s downfall? Mr. Rust reports that he found no “smoking gun” to this effect. Washington surely had ample reason to be disillusioned with Sihanouk, whose declared policy of “neutrality” tilted in favor of communist states — notably, the People’s Republic of China — which were trying to overthrow the Saigon government. Through the CIA and their own intelligence arms, both South Vietnam and Thailand knew that Vietnamese communist guerrillas used Cambodia as a launching pad for cross-border attacks.